We show this in every way, every single day. Tenant safety is a top priority. We regularly perform facility inspections. Our facilities are well lit and have video surveillance. Rest assured knowing your belongings are valuable to us, too! The customer service experience is key. We are always here to offer advice, expertise, and solutions. But perhaps even more importantly, we listen to the individual needs of our tenants. Honesty and integrity are practices in all aspects of business and are a requirement for our employees. With more than 30 years of experience, Diane has actively managed shopping centers, office buildings, industrial parks, and self storage facilities. Whether it is working with a client to develop a new launch marketing strategy or the daily problem solving and overall management, Diane is committed to the success of your real estate investment. Operating under the name Cox Armored Mini Storage Management, Inc. (CAMSM), each management contract is built to meet the needs of the owner’s expectations, with its guiding mission a commitment to the communities in which it serves. CAMSM employs some of the best managers in their respective fields and advocates the highest professional standards amongst the team and general business practices. Since 1995, under Diane’s leadership, the management team at CAMSM has provided effective, successful management of more than 40 properties totaling nearly 2.5 million square feet. 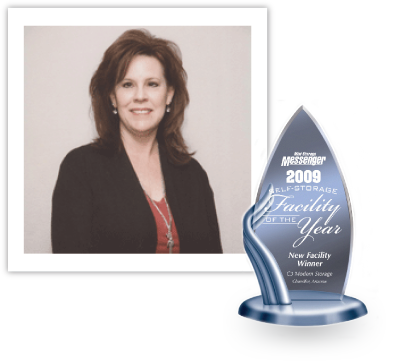 Diane’s self storage management operations have consistently ranked in the annual Top Operator’s list published by Mini-Storage Messenger and Inside Self-Storage magazines. Diane currently serves as an officer and director on the Arizona Self Storage Association Board of Directors. Cox Armored Mini Storage Management Inc. is a quality and reliable storage option for any and everyone living in or near the Arizona area. We look forward to helping everyone who has extra baggage lying around their house, garage or basement. Our facilities are located all over Arizona, so feel free to check out our locations page to find the perfect one for you. You’ll definitely appreciate our wide range of amenities in all of our facilities. We offer secure units, online bill pay, insurance, temperature controlled units, drive-up access, RV, car and boat parking and much more. Figure out which facility matches your needs and start storing with us today, the right way! CAMSM is among the Top 100 Operators in the US. We’re a 3rd party management company so our clients don’t need to re-brand their facilities in order to become our client. We also work with your existing software unless you’re ready for a change! Each facility is treated independently and staff is trained and tailored to the individual facility. Our training is top notch and continuously helps our site managers to reach both their personal and professional goals. Our goal is to increase your bottom line by rate management as well as reduced costs due to volume purchasing. Seeing that internet is the wave of the future, we have a first class SEO company staying in front of the ever changing online world! We know what it takes to put the pieces together to make your facility successful and a profitable investment for you! We know what it takes to put the pieces together to make your facility successful and a profitable investment for you!